ਦਿੱਲੀ ਦੇ ਮੰਦਰਾਂ ਵਿਚ ਕੀਤੀ ਜਾ ਰਹੀ ਗੁਰੂ ਗ੍ਰੰਥ ਸਾਹਿਬ ਦੀ ਬੇਅਦਬੀ ਨੂੰ ਰੋਕਣ ਲਈ ਸਿੰਘਾਂ ਦਾ ਅਹਿਮ ਉਪਰਾਲਾ, ਹੁਣ ਅਖੌਤੀ ਮਿਸ਼ਨਰੀ, ਕਾਲੇਅਫਗਾਨੀ, ਸਪੋਕਸਮੇਨੀ, ਦਰਸ਼ਨ ਮਲੀ ਕਿੱਥੇ ਗਏ? Note the large 'Singhasan' (right) of the Mandar head for sitting higher than Sri Guru Granth Sahib Ji Palki (left). The sewadar in the picture is about do to sukhasan and remove the saroop from the complex. Sticker put on Sri Guru Granth Sahib Ji : "Om Sri Naryan Sharnamon (name of Hindu deity)"
In this day and age Sikh religion is attacked from all sides and moreover this just a sign for things to come where Hindu Idols will be installed in Gurudwara Sahib and Hinduism has embraced Sikhi in it's fold so as a community we all need to wake up to reality before it's too late. Message from SGGS should be explained both in english and Punjabi so young generation should should realise that just bowing heads doesn't meananything. disrespect shown to ' GURU GRANTH SAHIB JI MAHARAJ by some Hindu officials this is not the way to move forward. Thanks to Singhs that SGGS was brought to place it belongs. hun sarna saheb ki karde ne je kursi bchani hai te kuch karo nahi te "rab rakha"
tey waheguru tanu singh nu chardi kala vich rekhan....? Dehli Sikh noujwan and Panthic.org doing good job. All the world Sikh Sangat is with you. Carry on respect of sggs ji. You are just bouncing the mud balls in the name of Sri Dasam Granth Sahib in the clean pool of Sikhism just to create confusion in Sikh Sangat. What about these Nirgun Granth, Ramayana, gita, and SIGHASAN? Are you not aware of the happenings under your own nose and are able to point Nanded and Patna Takht Sahibaans. Where is now your so called puppet Darshan Lal? Now is he seeing Satkaar of Guru Granth Sahib? thank u very much panthic.org 4 creating awareness among the sangat & the material put up by u is exclusive a i m happy 2 know that u people have made a lot of efforts 2 give us this correct info which is actually not provided by the other websites. te panthic walya da bouht bouht shukrana ada karda ya jina ne aaj tak sikhi marg di te sikhi virudh galla nu sangta te sanmukh sabuta naal rakhya hai..
Not only Sarna Ji but where is now SGPC, Badal Ji, Damdami Taksal, Akhand Kirtani Jatha and all the SAINTS and SOLDIERS of Khalsa Panth. Are all of you sleeping???????????????? We should support these guys as they had played their role, now its our role to help them till end. I personally felt very bad as none of the responsible personalities are coming forward to pay their homage to OUR SHABAD GURU. Many Thanks for raising this issue on this platform. We all pray for you to remain in High Spirits. Interference from Sri Akaal Takhat Sahib on this issue is required at the earliest. We are hoping that all the culprits to are sporting directly or indirectly in these types of crimes should be punished severely. No book should he installed like and at par with the Guru Granth Sahib . Worship of any idol or any ritual or activity should not be allowed to be conducted inside the Gurdwara. Nor should the festival of any other faith be allowed to be celebrated inside the Gurdwara. However, it will not be improper to use any occasion or gathering for the propagation of the gurmat (The Guru's way). DSGPC approached Gy. Gurbachan Singh who is coming rto delhi to inspect the Sindhi Mandir. 1. Nobody in the world could change the SRM even a Jathedaar. (Already a Jathedaar is ex-communicated for breaking SRM). 2. 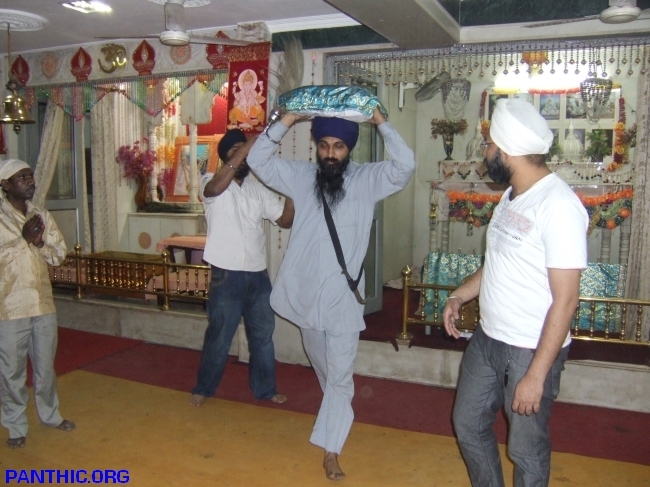 A Sikh is not expected to enter a MANDIR. 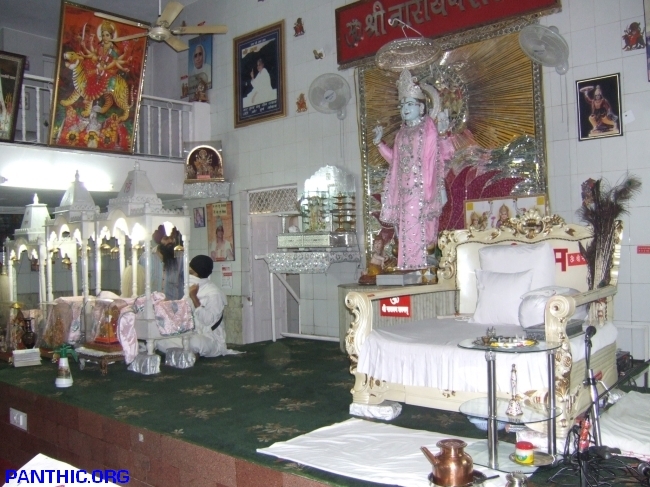 Moreover a Jathedaar in SINDHI MANDIR that too a NIJ THAU of Chelaram. Shame on us! First of all he should ask DSGPC to change Name from NIJ THAU MANDIR to Gurudwara Sahib and it should be affilated by DSGPC or SGPC. waheguru sumatt de ena nu! I cant comment without veryfying the truth but looking to the pics posted here it looks the things are genuine. If it is such I totally agree with you that it is not good on the part of DSGMC. They should have taken the steps themselves. Now it is very bad to see the way people are doing this insult to the Saroops of SGGS Ji and I strongly oppse this and request Sarna and others to take action and do the needful at the earliest. Sarbat khalsa jio waheguru ji ka khalsa whaeguru ji ki fateh jio,eh jo asi dekh rahe aa eh bahut mangg bhaga hai sarbaat sikh jagat lai. eh hinduwaad mahman dimaag bahut tej te bhut shaitaan hai eh sabh sikhan vich apsi chagre te foot pvaun lai karde haan taan ke sikh aaps vich hi larhde rehn te ikmuth na baith sakn. so mein sarbat khalse nu eh apeal karda aa ke asi is nu koi issue nahi bnauna balke mandra vicho apne guru shri guru granth sahib ji de saroop da parkaash band krauna hai te eh kiven ho sakda hai eh delhi parbandhak committy nu changi tra pata hai. is lai main delhi de sikhan te sarna bhai saab huna nu benti karda aa ke jiven v hove jaldi ton jaldi mandiran vicho guru sahib de saroop nu vapis guru ghar leanda jave . Satgur ji d satkar har halt vich hona chaida. Mandir vich ta aprkash krana da matlab hi nahin he. Sarna ne kuch nahin Karna kuike us ve votan di lorr he. Badal Dal, Saran dal there is not much difference among these so called Gulam of Srakar. DHAN DHAN, DHAN KO BHAKIYE JA KA JAGAT GULAM!! SABH NIRKHAT YA KO FIRRE, SABH CHAL KARAT SALAM!! eh kamaL hai akaal purakh WAHEGURU di kirpa da..
Really good efforts,I request you guys put Manikaran in your next project. waheguru ji ka khalsa waheguru ji ki fateh "
These saroops must be removed if necessary by force.It is absolutely degrading to place guru saroops in mandirs or non- gurduara buildings. Other issues like the largest Guru Granth sahib being prepaid in Puchong Gurduara,KL, Malaysia by the pardhan B Awtar Singh MUST also be stopped and action taaken against such minion culprits and anti sikh elements.